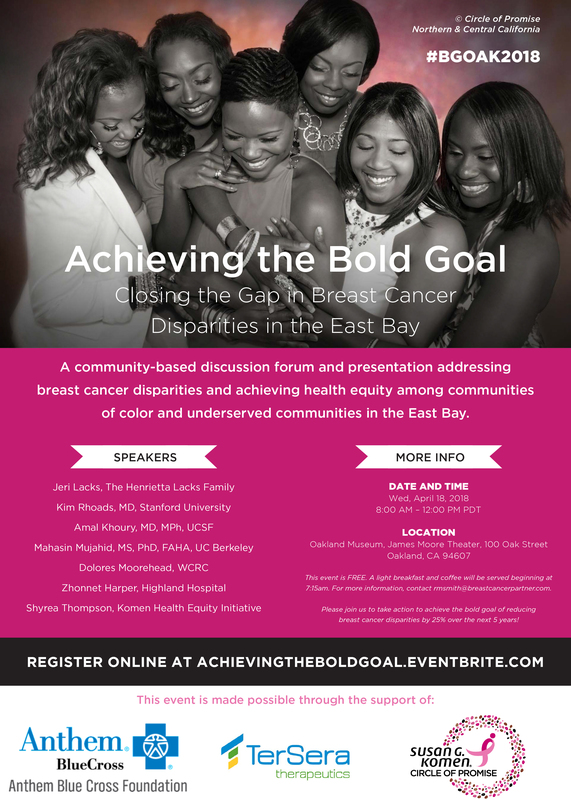 Susan G. Komen San Francisco Bay Area is proud to be a part of a statewide initiative to address the breast healthcare disparities among African American women. What is Circle of Promise? The Komen San Francisco Bay Area Affiliate, together with the six other affiliates in California, is working to address breast cancer disparities at both the system and individual levels. Our state-wide initiative will enable Komen to coordinate and deliver partnerships and resources that assist African American women most in need. • Community Organization: Building partnerships and leveraging strategic relationships to address barriers by pooling resources, sharing best practices, reducing redundancies in services, and uniting partners around the project’s goals and objectives. • Direct Education: Komen-supported community educators will provide direct outreach and aid women in scheduling a mammogram appointment. These educators will also provide continuous follow-up to support women through the process and increase the rate of completed mammograms. • Screening and Navigation Services: Komen’s community organizing practices will help to identify available services, ensure that services meet the standard 60 day quality care benchmarks and provide supplementary grants to fill any gaps in screening. Additionally, each Affiliate will utilize a grant-funded patient navigator to coordinate follow-up. “Breast Cancer Partner was chosen to lead this ground-breaking work for its proven track record of designing and implementing results-oriented programs,” said Anita Brink, President of Susan G. Komen in San Francisco. “When found in its earliest stages, breast cancer has a survival rate of nearly 98 percent. But a woman has to get a mammogram in order to catch breast cancer early. We needed a partner who shared our vision and passion for this work, with the depth and breadth of experience to ensure that we achieve the goals of the initiative and Breast Cancer Partner, led by Rhonda M. Smith, was the clear choice”, said Brink. This video was presented at Komen’s Leadership Opening Session on July 17, 2014 and features our very own Jackie Taylor, Komen Sacramento African American Ambassador and clips from the Susan G. Komen® Circle of Promise ® California Initiative (Empowering African American Women for Breast Health Care Access) Press Conference held in Sacramento on May 7th, 2014. Join us: register today at www.circleofpromise.org and make your promise to take care of yourself first and then become an ambassador to your community! We’ll provide you with all of the resources and tools you need to make changes in your own life and to share lifesaving messages with others.